This was what some local media reported in October 2011. As misleading as the headlines seem, that is what exactly the people deserve after seeing SESB (formerly known as SEB and NBE) in operations for more than 50 years. A better fit for purpose title would have been 'Towards 100% power supply coverage in 2012' so as to ward of unrealistic expectations. The then Managing Director of SESB, Ir. Baharin Din said it was targeted that Sabah would reach 95% electricity coverage by the end of this year. Something the utility company must strive to achieve to walk their talk on "WORKING HARDER FOR BETTER POWER". This is also the least that the people can expect from the RM962.5 million of allocation for electricity supply in rural areas in Sabah under The 2012 Budget. As it now stands, electricity coverage in Sabah is about 80%, and by looking at the development plans and data released by SESB from time to time, I'm confident that the additional 15% more of coverage is realistic and achievable probably by 2013. Also, an interesting fact worth mentioning is that, by percentage, SESB is currently the biggest taker in the country on Renewable Energy initiatives. 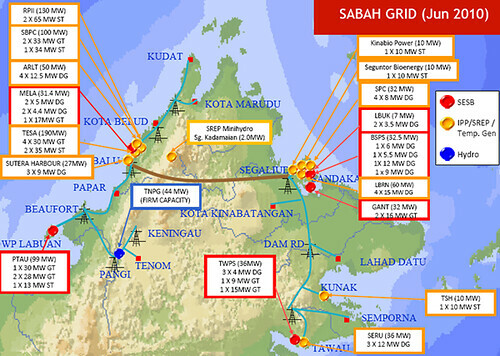 The contract for take-off in 2010 accounted for more than 30MW capacity or about 3% of Sabah Energy Generation share. In comparison, the national average is less than 0.5%. The new SESB MD, Ir. Abd Razak Salim is expected to continue to steer the utility company to play major role in encouraging such RE initiatives, in line with the national objective to minimise the impact of power generation on environment. The allocation of almost RM1 billion is huge and whoever is entrusted to carry out the task is duty-bound to deliver the goods. Infrastructure network, especially in the rural areas has been the stumbling block for rural electrification due to the geographical condition of the state. It is a huge challenge we know but it is a good opportunity too. I say, if the mountainous terrains of Sabah is to blame it is about time that we turn to Greener Source of energy. It is no doubt more expensive but that is what the big allocation is for. Last year, Malaysia through SEDA, has embarked on feed-in-tariff initiatives for 4 sources of renewable energy and it will be all the more meaningful for the state take que from and be aggressive in its effort towards environment-friendly power generators. COME ON! Let's go for 100 percent. That will do for the rural rakyat! @tehr. Ya, kualiti pun penting kan. Not just quantity. I believe Ir Abdul Razak is a very capable person to bring this 100% coverage into reality,knowing his no nonsense,straight forward and very honest approach into things. A ride around Labuan will show good works he left behind before moving on to KK. I wish you luck with this admirable goal in the new year! Jgn asik ckp jak tapi tak buat...kampung sy masih jalan gravel, lubang sini sana..elektrik cuma ada 2011..itupun dah bertahun2 janji..
@Meitzeu, thomas, MaryaYusof, smilla4blogs - let's see bout that. But fingers crossed. @Elih Japahar. Kg beliau sa belum ada bekalan letrik. Disenaraikan dlm perlaksanaan 2011-2012; smpai skrg tiada berita!